Local installations Available (UT & ID). Ground Sleeve Installation $250.00 plus trip fee. Email info@flagspolesbanners.com for more information. All of our flagpoles are molded in one piece, using the beautiful Greek Entasis taper design – the classical shape of a candle. Our fiberglass flagpoles will not pit, corrode, or rust. This is extremely important near salt water or in rugged weather conditions. Unlike wood that can rot, or aluminum that discolors and pits, our flagpoles have an ultra-hard, gel-coat finish that is impervious to all weather conditions. Fiberglass will NOT conduct electricity like ALUMINUM. No ground wires. NO LIGHTNING WORRY. Easy Installation! Our standard flagpole has a brilliant white, pre-cast gel-coat finish. Other colors are available on special request. All poles have the same dura-hard, fade-free, weather resistant finish. 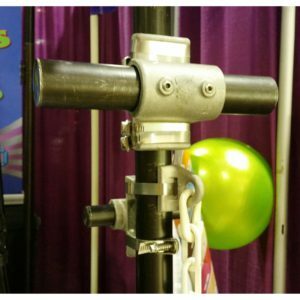 All poles come with a special designed, high quality, revolving-truck as standard equipment. 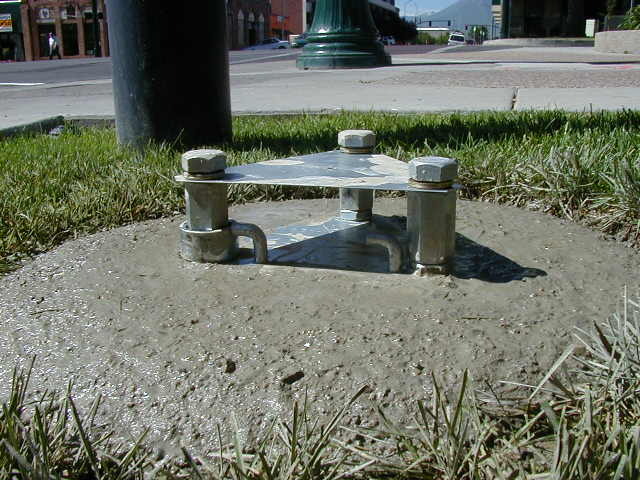 The heavy duty hinged ground attachment offers the homeowner or professional installer easy installation. One person can raise or lower a 40 ft. flagpole. The easy to use leveling system makes installation simple and fast. Mounting kit comes complete with all fittings, hardware and anchoring rods. Includes halyard, cleat, flag attachments, revolving truck and finial. Nothing extra to purchase. Flagpoles have come a long way since the axe man returned from the forest with a 20′ cedar on which to hang the family crest. Now the modern fiberglass pole is being transformed and refined into a state of the art product. The pulleys that were once standard equipment on all flagpoles have been eliminated entirely. No need to worry about pulleys jamming or breaking. They have been replaced by machined and highly polished aluminum races that are set into a high-density polymer truck assembly. Best of all, this entire truck assembly revolves 360 degrees for unobstructed flag flying during the most changeable of breezes. Flags are no longer hung up on the wrong side of the pole, and whether the wind is coming from the east or the west the truck assembly will swing to let the flag fly perfectly. Above the truck assembly is no ordinary finial. The painted or anodized metal ball has been rethought, resized, and replaced. No longer does the flagpole owner need to worry about the ball fading, flaking or pitting next to the blue sky. Instead, he can look up and always see a highly reflective, dazzling gold finial. The secret is in a high-tech process known as electrostatic plating. Gold paint is electrostatically adhered to the inside of a clear high density Plexiglas finial and because it is on the inside, this finish is not exposed to rain and other weathering elements. A simple, but high-tech and carefully thought out solution to an old problem. Next, how do you trim the weight of a 20 to 40 ft flagpole, making them more manageable and easier to install, but still maintain high strength? How do you cut down on an overly large base diameter that makes the flagpole look ponderous and stout? To answer these questions we have to understand that our flagpoles are made by using an innovative high strength method. Inside a steel clamshell mold, seven layers of reinforced fiberglass roving, mixed with a polyester resin is aligned in a vertical plane for maximum strength and placed on a thick layer of gelcoat. 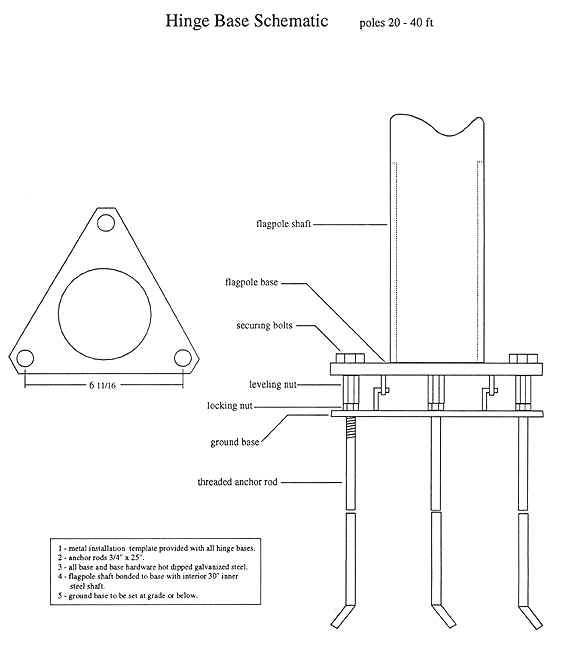 An inflatable bladder is layed the length of the mold. The mold is closed, the bladder inflated and the resulting pole is created by subtle inside pressure and slow curing during an exothermic chemical reaction. The result, a lighter weight, stronger, more slender and graceful flagpole on the market today. So strong in fact, that tensile strength is 50,000 pounds per square inch. Each pole is rated to withstand wind speeds of 120 mph. These are only the major innovations. The predrilled and stainless steel inserts for the cleat bolts, the optional internal halyard winch, and the optional hinge base are the frosting on the cake. Designs In Motion warrants that its fiberglass flagpoles will be free from defects in materials and workmanship, under normal use, proper installation, and responsible care for a period of ten years from date of first shipment to the original owner. 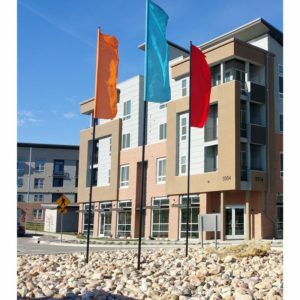 Designs In Motion further warrants that during use by the original owner after proper installation and responsible use, all residential and commercial flagpole shafts will withstand wind gusts up to 120 miles per hour, unflagged. The use of oversized flags will negate this warrantee. As well, in the event of extreme weather conditions such as hurricanes, monsoons, tornados etc. it is the responsibility of the owner to remove all flagging in advance of the bad weather. The exclusive remedy of the Buyer in the event that any of the goods do not conform in accordance with the above warranty, shall be limited to replacement or repair of the item or parts claimed to be defective. All goods claimed to be defective must be shipped to Designs In Motion. Such goods will be returned, repaired or replaced within a reasonable time period and this shall constitute a complete discharge of the seller of any and all liabilities or damage for such goods. Designs In Motion shall not be responsible for removal, installation, shipping costs, or any incidental or consequential costs. Designs In Motion acceptance of the goods, so shipped, shall not be deemed an admission the goods are defective. The size of grounds and buildings are always important when determining the correct size flagpole for your particular application. 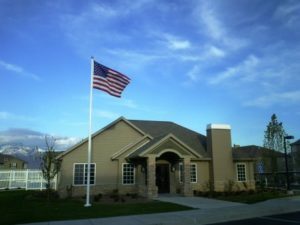 Generally, in residential settings, flagpoles 20 and 25 feet in height are compatible with most one and two story single family dwellings. White fiberglass flagpoles are always most complimentary with any architectural style. They have elegance that is striking against any residential setting. Whether your house is situated on water, a lake, a river, or the Atlantic and Pacific Oceans, nautical poles will look great. These poles are fitted with a yardarm that stretches across the pole about a third of the distance from the top. This yardarm can hold two additional flags on each side of the flagpole. Originally popular in New England and along the Atlantic Coast, yardarms can now be found in almost any part of the country. Flagpoles complementing commercial buildings can be found in sizes 20 feet and upward. Once again the size of the building and grounds are the deciding and most important factors. For office buildings flagpoles, 40 to 60 feet in height add a final corporate statement. Remember, however, some buildings will look just as elegant with poles only 25 feet high. Many companies will use two poles and fly the US and state flag. Another option is to use three poles and fly the US, state, and corporate flag or banner. Flagpoles can also be used at entrances or gateways or along drives leading up to corporate headquarters. With whatever option best suits your taste, Designs In Motion has the technology and innovation to best suit your wants and needs. 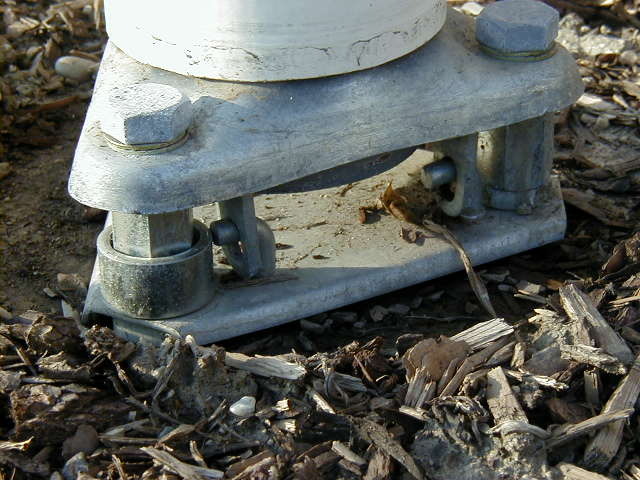 The heavy duty hinged ground attachment offers the homeowner or professional installer easy installation. One person can raise or lower a 40 ft. flagpole. The easy to use leveling system makes installation simple and fast. Attractive, strong, hot-dipped zinc galvanized steel base. Available in 20/25/30/33/35/40/50/60 ft. lengths. Can be easily taken down and moved to a new home or building location yet offers more security than a ground sleeve flagpole. 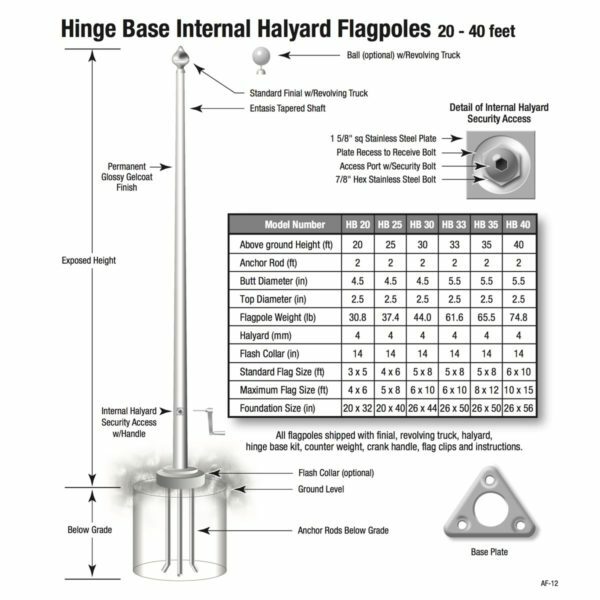 All hinged base flagpoles can be purchased with the new, innovative Internal Halyard System. 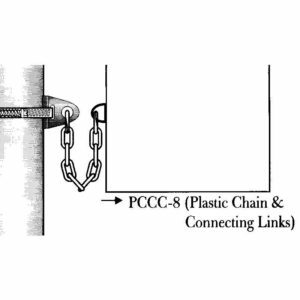 The standard external system has the halyard outside the flagpole and ties to a cleat. 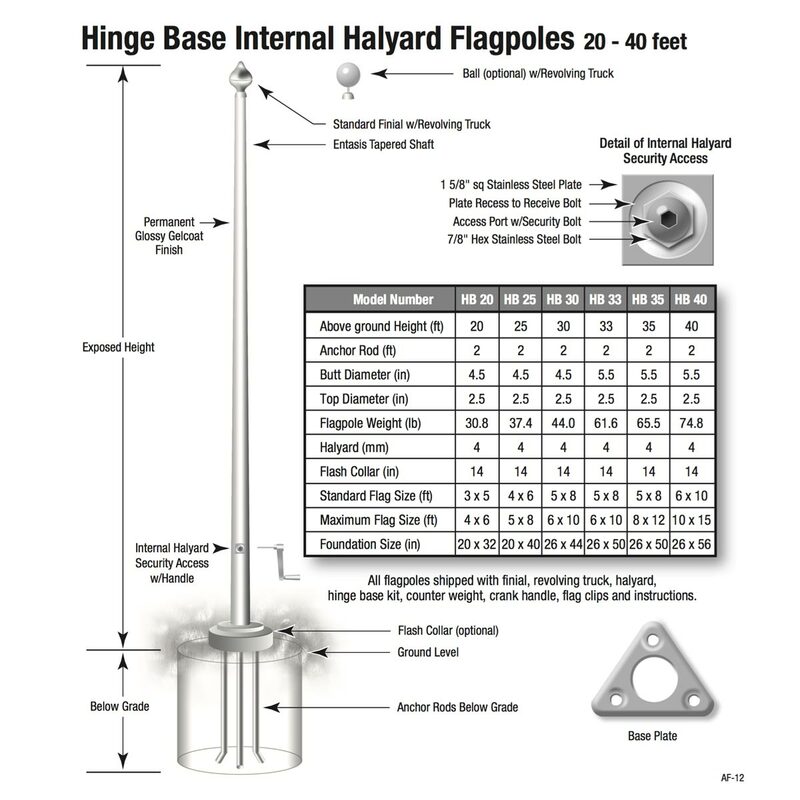 The Internal Halyard System uses a special designed winch of high tensile steel, stainless rollers and brass bushings mounted inside the pole to raise and lower the flag. No exposed halyard to slap or be exposed to the elements. An attractive nylon covered counterweight is provided for attachment to the flag to keep it in proper position.